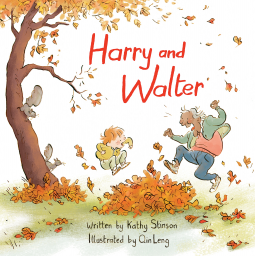 This is a sweet picture book story about friendship. Harry is four and three quarters and Walter is 92 and a half, but they both enjoy the company and play together. Annick Press and Net Galley allowed me to read this book for review (thank you). It has been published, so you can grab a copy now. Harry is devastated when his parents decide to move. He can't take Walter with him and he's going to miss him so much! It's so bad Harry and Walter don't even say goodbye. Walter stays in while they drive away. Harry can still rake up leaves and he grows tomatoes like Walter did but they don't taste as good and raking the leaves is no fun doing it alone. One day, while he's playing outside, he hears a familiar voice. Walter has come to visit! It seems Walter moved to an apartment not too far from Harry's home. He's got Walter, his friend, back again and life is looking a lot better. Ms. Leng's illustrations show the whimsy of old age and youth and Ms. Stinson's words make you smile. Your child will want to read this one again and again.